Words alone fail to describe the harrowing experience endured by the Rohingyas during the coordinated ethnic cleansing by the Myanmar army in Rakhine State since August. Visiting the 12 refugee camps in Ukhiya and Teknaf for over a week, this correspondent reached out to some of the lone survivors who had lost most, if not all, of their immediate family members and other relatives in the atrocities. Sixty-year-old Mukinnesha was unable to control her tears as she described losing her whole family in just under an hour on August 27, the Sunday before Eid-ul-Azha. 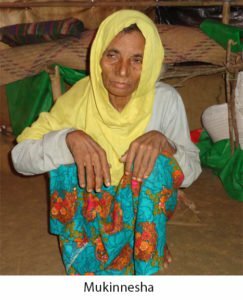 “The Myanmar army and their associates – Moghs – attacked our house around midday, forcibly bringing out my husband, Abdus Salam, and my two sons and me,” said Mukinnesha, who came from Rabailya village under Maungdaw township of Rakhine state. Mukinnesha said that when she was fleeing her village later the same day, some neighbours told her they had seen the bodies of her sons – Rafiq and Shafiq – lying in a ditch. “I just cried – for my sons, for my husband. What could I have done but flee? I somehow saved my life coming to Bangladesh,” she said. 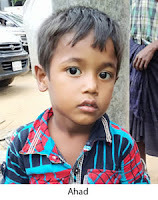 Shahidul Amin used to reside in Maungdaw’s Deultoli with his family but is now an orphan, living under the supervision of a foreign aid organisation in Kutupalong. He is only ten years old. When asked about his family, Shahidul went quiet for while and then started weeping as he recalled the day the Myanmar army killed his family shortly before Eid-ul-Azha. “When the army attacked in the morning, I, along with three of my friends, were collecting firewood,” he said. “Suddenly, we heard gunshots and the four of us hid behind a bush, passing almost the whole day there out of fear of getting killed. In the evening, we rushed to our houses. “I can never forget what I saw that day – my house was burning, the cattle shed empty, and on the yard were kept the bodies of my father, mother and my four brothers. Later, I called for my sisters but no one responded. The ill-fated boy then endured a 15-day walk just to reach the relative safety of Balukhali in Ukhiya. There are stories pouring out of Rakhine state that are even more horrifying than Mukinnesha or Shahidul’s. This correspondent talked to Sebika Begum’s (pseudonym), a resident of Maungdaw’s Tulatoli area. Raped, abused, tortured and left to die, Sebika is the only living member of her family after the Myanmar army burned the rest in front of her. “The army killed all 18 members of my family in a night, throwing them – alive – into the fire that they had set to our house,” she said. “My father Ali Ahmed had begged them for mercy but instead, they stabbed him with the bayonet attached to their rifles and threw him in the fire. “They threw my mother Feroza Khatun, five brothers, five cousins, three uncles and their wives into the fire and waited there until they all died. I saw them burn right in front of me. Buthidaung’s Fatema fled Myanmar in mid-October with her village people. 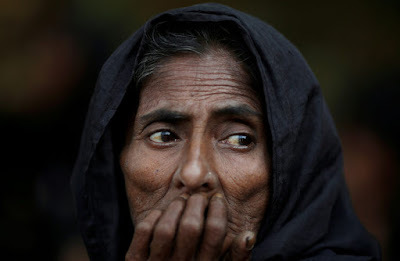 She did not talk with this correspondent but to one of her villagers, Sufia Khatun, who said she Fatema had lost her husband, five sons and two daughters as the military indiscriminately fired at them and the Moghs burned their house. An orphan since childhood, Mizan Ali, 25, who resided in Buthidaung’s Sherangdaung, made a living through farming on the land he inherited from his parents. Mizan married his neighbour, also called Fatema, a few months before the latest atrocities began. On the night of August 23, army men picked-up his wife from their house, and she was never to be found again. “She was the only one I had in my life, but I lost her,” he said. Mizan, who came to Balukhali camp about a month ago, said he had heard from his neighbouring villagers – who reached the camp recently – that the army and the Moghs had grabbed all the land on which they used to reside. 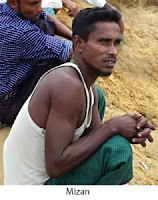 For Jafor Alam, who resided in Maungdaw’s Boro Gowji Bil area, maybe a tough but happy life was waiting just across the Naf River as he, along with his wife and two kids, managed to reach a boat that was leaving for Bangladesh. That was before indiscriminate gunshots from the Myanmar army sank the boat. Three-year-old Ahad was found crying in the yard of his house as he could not find his parents, said Rajia Begum, who is Ahad’s distant grandmother in relation. Like Ahad, the Bangladesh government has found 23,487 orphan children who have lost their families to the torture and killings of the Myanmar army and the Moghs. The Rohingya are a stateless community and one of the most persecuted minorities. Myanmar does not recognise Rohingya Muslims as citizens, and forces them to live in squalid camps under apartheid-like conditions.